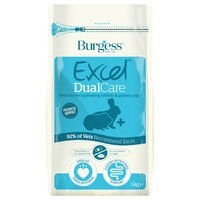 Burgess Excel DualCare Recovery Diet is a complementary feed for sick or recuperating rabbits and guinea pigs (fibrevores). Suitable for feeding after illness or surgery, Burgess Dual Care contains long length digestible and indigestible fibre to aid recovery and recuperation. These high levels of fibre along with prebiotics to promote a healthy gut flora, also help to support gastro intestinal function. Containing all the necessary nutrients, vitamins and minerals required to meet the nutritional needs of both rabbits and guinea pigs, Dual Care also contains Magnesium Trytophan and high levels of protected Vitamin C to help support and meet increased requirements during times of stress and recovery. Burgess Excel Dual Care can be fed either in its dry form as a nugget, or can be softened by the addition of warm water to make a paste that can then be syringe fed using a wide tipped syringe. Always ensure your rabbits or guinea pigs have plenty of hay and fresh water available. My chinchilla was sick and he didn't eat any kind of food, nuggets, hay.... So we gave this food as syringe fed using a wide tipped syringe. 1st time he got on well, I hope now he and her mom will healthy again. Unfortunately there is no opportunity to buy it in Hungary, so I ordered from VetUK. All the doctor recommend this food, until they check it. I love this product! When my guinea pig was very very poorly and wouldn't eat anything this is what kept him going for a whole 2 years!! I couldn't be more grateful for this product! And at vet uk it is a fantastic price!